Just two letters left in the alphabet! The penultimate entry in my Star Wars ABC's is a no-brainer! Yoda is the Mr. Miyagi of the Star Wars universe (which, of course, makes Luke The Karate Kid). At first glance, he doesn't look like much. Impish, foolish, buffoonish...a small-minded, wide-eyed creature who doesn't understand things like technology or acceptable norms of personal space. This dummy's no dummy, however. Yoda's the smartest being you'll ever meet. Strike that; he's the wisest being you'll ever meet. Don't be fooled by his cuddly Muppet exterior, for within Yoda beats the heart of a Jedi Master. Impossible to please, his training methods are unorthodox (I don't remember any of my baseball coaches forcing me to strap them to my back and run through a forest), but his calm, understated determination will win over even the most skeptical Jedi prodigy. Unless, of course, your name is Luke, you rush off in the middle of training to fight Darth Vader, and then return to "complete" your training only to cover Yoda with a blanket and watch him disappear. 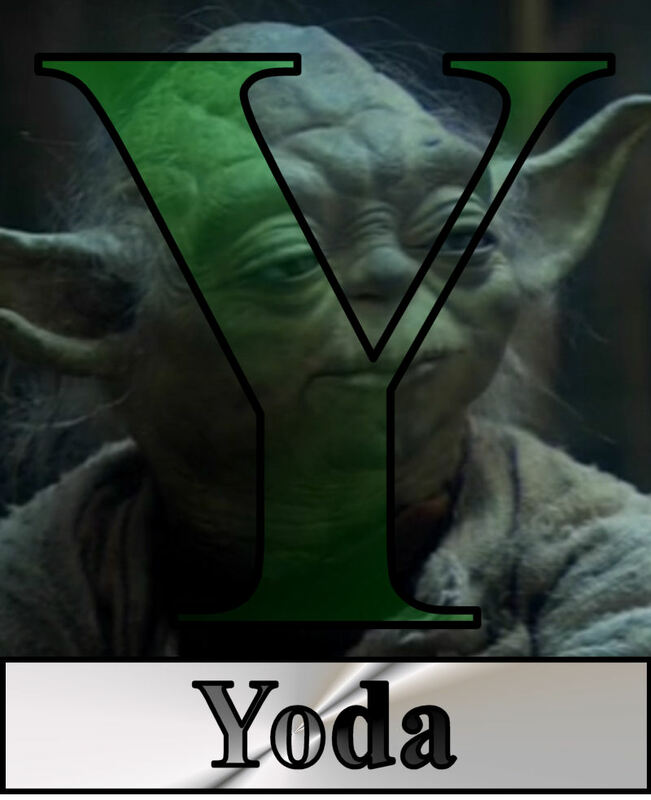 Other than his small size and Grover voice, Yoda's most memorable trait would be his cryptic, backward speech pattern. Actual person: I can help you. Yoda: Help you I can. Actual person: I'll take you to him. Yoda: Take you to him I will. Actual person: It's time for the Jedi to eat. Yoda: For the Jedi it is time to eat as well. Actual person: I've watched this one for a long time. Yoda: This one, a long time have I watched. TOMORROW: The final installment of my Star Wars ABC's! Meet the unsung hero of The Empire Strikes Back!